Lehigh Valley’s Allentown, Bethlehem, and Easton are full of creative types and go-getters, it’s no wonder that there are so many awesome and locally-owned shops all over the region. Here’s a quick reference to some favorite places to shop, each one unique to Lehigh Valley and owned by some very hip, creative, and savvy Lehigh Valley-ians. Find something for everyone on your holiday shopping list - and treat yourself as well - at independent boutiques and along charming main streets. You’ll find deals and holiday specials throughout the season, and best of all, there’s no sales tax on most wearable goods. Put on some comfortable shoes and get ready to check off your holiday shopping list with the picks below! And top the excursion off with a little bit to eat at area restaurants to keep your taste buds satisfied. Hours: Tuesday - Thursday 10 a.m. - 7 p.m.; Friday & Saturday 10 a.m. - 9 p.m.; Sunday 11 a.m. - 6 p.m. Known for their puppet theatre, Book & Puppet Co. is a family-owned book and gift store located in downtown Easton. They offer a great selection of new books for children and adults, including the latest releases, Spanish language books, classics, and more. Besides books, the store stocks craft kits, toys, games, calendars, stickers, and postcards, and offers workshops and storytimes, among other special programming. Hours: Wednesday - Saturday 9 a.m. - 7 p.m.; Sunday 9 a.m. - 5 p.m.
Glass cases aren’t just for expensive jewelry. At the Easton Public Market, a glass case contains tiny works of art, edible art - perfectly lined up and displayed, each more intricately painted and more beautifully designed than the next. These little gems are the truffles crafted by Jean-Paul Hepp, using attention to detail, fine ingredients, and devotion to Old World techniques. You’ll find a full range of traditional fillings including flavors such as raspberry, mint, and strawberry. His best-seller is a caramel Himalayan sea salt, which features a filling of smooth creamy caramel topped with salt. Seasonal flavors rotate through with hints of chili and spice, as well as peppermint and cinnamon, and when combined with his Belgian palate, each is quite pleasing. Hours: Tuesday - Saturday 11 a.m. - 6 p.m.; Sunday noon - 5 p.m.
Co-owners Derrick and Warren Clark originally launched Domaci as an online-only furniture retailer specializing in sustainably-sourced solid-wood furnishings and unique homewares and gifts, like t-shirts with Musikfest mug graphics or Bethlehem pennants. Today their South Bethlehem location allows shoppers the same “mix of old and new, and unique and stylish decor” that customers have come to expect and love. Domaci’s locally-made products from Rustik Rehab include turning reclaimed and salvaged wood into custom furniture pieces and decor. 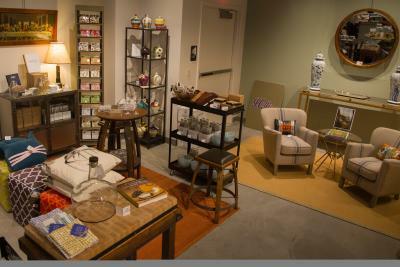 And if you aren’t sure what new piece to add to your space, their in-store design bar can lend great advice! Hours: Monday - Wednesday 10 a.m. - 5:30 p.m.; Thursday - Saturday 10 a.m. - 8 p.m.; Sunday 11 a.m. - 5 p.m.
Donegal Square brings the best of Ireland and the British Isles to Lehigh Valley. Whether you are searching for a gift for someone who loves Ireland, or want to show some Irish pride yourself, you’ll find it on Main Street in Bethlehem. 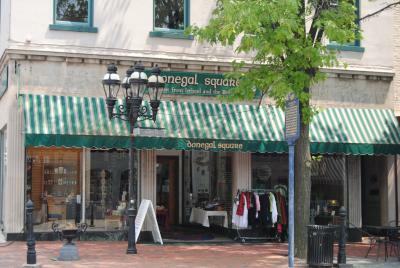 People often call Donegal Square “The Irish Store”, but they carry items from many Celtic Nations, such as sweaters and woolens, Nicholas Mosse pottery, Shanore and Keith Jack Jewelry, Ogham Wishes, and more, including chocolates and biscuits. Hours: Wednesday - Saturday 11 a.m. - 8 p.m.; Sunday 11 a.m. - 6 p.m.
Mercantile Home is a line of artfully hand-made objects, accessories, and curiosities created by husbands Ken Jones Jr. and Ron Morris. Made in the couple’s studio, these one of a kind creations incorporate classic handcraft and playful design, while blending seamlessly into a wide variety of personal styles. The products are often made with sustainable and up-cycled materials. An example and frequent request is their Bonnie and Clyde tote bags, made from old canvas money bags, as well as jewelry they make from buttons and zippers. It’s also the place you’ll find “made in Easton” swag and small gifts. Hours: Monday - Friday 11 a.m. - 8 p.m.; Saturday 10 a.m. - 9 p.m.; Sunday 11 a.m. - 6 p.m. 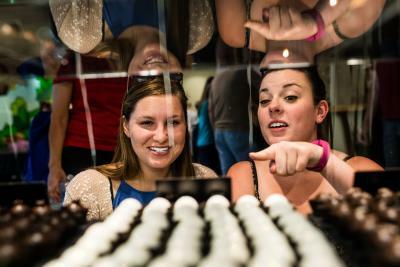 While hitting the pavement at the Promenade Shops at Saucon Valley, you’ll want to pause for a break at The PEEPS & COMPANY® where you can re-energize yourself and your candy cravings. The store offers a fun, adrenaline-filled experience that appeals to the senses. Make it your stop for the famous, locally-made, Just Born candy including MIKE AND IKE®, HOT TAMALES®, GOLDENBERG’S® PEANUT CHEWS, and the marshmallow goodness of PEEPS® Brand Candies. Not only can you stock up on your favorites, you can indulge in high-quality branded items that will leave you on a sugar high without the calories. From apparel, accessories, candles, and more, you’ll be sure to leave with a little extra pep in your step. Thinking about redecorating or adding a statement piece to your room? Locals Ron Susser and Jon Clark launched the store in its newest location in revitalized downtown Allentown early in 2018. Re:find features one-of-a-kind, unique art work and home decor treasures created by local artists throughout Lehigh Valley with everything from contemporary upholstered furniture to restored Chinese antiques, artwork, and reclaimed or repurposed items from the past. It’s a place you’ll find dining tables, cabinets, coffee tables, and consoles made from items such as Bethlehem Steel I-beams and foundry patterns. There are also several pieces by prominent New York artists included in the mix. Known to locals as the ladies’ boutique with a strong emphasis on accessories, The Shoppe at Historic Hotel Bethlehem works hard to find companies that do not otherwise have a presence in Lehigh Valley. As an example, the faux fur collection is made in Seattle and designed exclusively for The Shoppe. You’d also be hard pressed to find pants, other than leggings- most items would be along the lines of things you’d wear “on top”, including this season’s go-to item, the wrap. Highly sought-after Bethlehem and Moravian stars are made locally in Nazareth of beveled-glass. And all of these stunning and exclusive gifts pair perfectly with your favorite rich and smooth flavor from Penn State Creamery, located on-site at the Historic Hotel Bethlehem. Holiday Hours: Monday - Saturday 11 a.m. - 6 p.m.; Sunday noon - 4 p.m.
Kutztown-based fashion jewelry-maker Sorrelli designs handcrafted jewelry from genuine Swarovski crystals and semiprecious stones. Pieces, including necklaces, earrings, bracelets and rings, are designed to become heirlooms, handed down through generations. In addition to its downtown Allentown location, another stand-alone store is located in Kutztown, but jewelry lovers can find collection pieces at dozens of spas, speciality stores, and independent retailers throughout the Mid-Atlantic. Hours: Monday - Saturday 11 a.m. - 5 p.m.; Sunday noon - 4 p.m. Sentiment, symbolism, and sometimes a little snark. 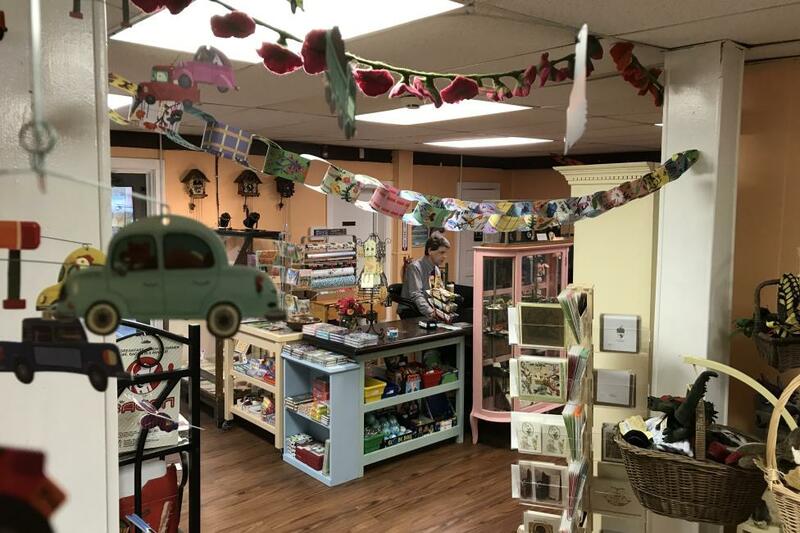 A token of surprise and small gifts can be found in downtown Allentown with handcrafted greeting cards, housewares, handbags, jewelry, and more. Vegan leather bags, hand-painted noodle bowls, toasted pumpkin soy candles, and mood stone earrings are among the top picks this holiday season. For more great places to shop in Lehigh Valley, click here.